Reading through Ultimate Thor #1 I started to see similarities between this comic of the day and several other popular (acclaimed and not) comic culture stories. The first thing I thought of when seeing Thor in Ultimate Thor #1 was that he is basically Shia LaBeouf's Sam character from Transformers 2: Revenge of the Fallen. First off, I know the plot wasn't up to critics' standards, but the CG and action sequences were sick. I Transformers 2 for it's popcorn nature, so there! Secondly, I compare Thor to Sam because he is crazy style writing symbols, read by few, in random locations. Thor is writing symbols all over the floor in some lab where a pad of paper and pen has to exist. Does he have to sketch all over the floor? That labs poor janitor. It's one thing to sweep up, but to buff out sketchings...I hope he get's overtime. 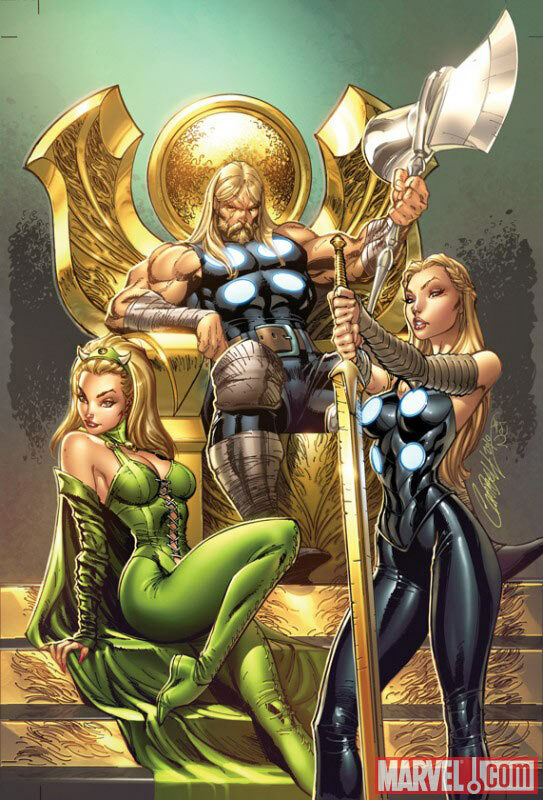 The second story I see in Ultimate Thor #1, and in Thor stories in general, involves the comics' use of the ice giants. They are Thor comics' robotic foot soldiers. Like the foot soldiers in the Teenage Mutant Ninja Turtles comic books and cartoons, the ice giants are enemies which the Thor characters can destroy in brutal ways without the use of gore or blood. When the Ninja Turtles would stab into and bust apart the robotic foot soldiers (and even Mousers) it did not seem overly brutal or wrong for children to view. It wasn't like Raphael was sinking his sai into a human heart. No, no, no. That would be too violent for the average reader. Thor books got it right a long time back when Thor was fighting ice and rock based characters. Ultimate Thor #1, or Teenage Mutant Ninja Transformers 2 as it's also known, also includes some fantastic ink work by Dexter Vines. I know that subject shift came out of nowhere, but the art was very well done in this book and I had to mention it in some way. Vines captures the character design and makes every focus point in each panel pop. I don't always notice the inkinginging (sure that looks weird but look at the word "inking" spelled correctly...that looks just as strange, but shorter), Ultimate Thor #1 must be noted as a comic book with a hell of an ink job (also the term for an octopus bj).